Couple See Purple Squirrel…..and they were sober too. Usually if I personally spot anything purple, including a squirrel, that’s only an indication that I’ve had way too much to drink or I over did it on one of my daily medications. Why am I purple? Cause it's freakin' cold out here ya dummies! Might be this particular squirrel is into holding its breath for long periods of time while stuffing its mouth with acorns rather than making several trips back and forth to the ol Oak tree. That definitely would cause a squirrel to turn purple. Works for me too when I’m in an argument with my other half and she has the upper hand and I tend to hold my breath while waiting for an opportunity to get a damn word in. In this instance, it was a zoologist. Which is a person who hangs out at zoos in order to explain things like why baboons have red thingys and play with themselves all of the time….stuff like that. Anyhow, this zoologist suggested that perhaps the squirrel may have fallen into a Porta-Potty. 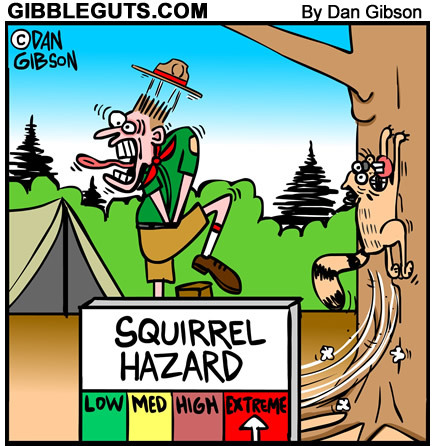 Which, to me, doesn’t explain the purple color, but, I would think that if the squirrel did indeed fall into a Porta-Potty the ol sniff test would confirm that fact. (I’ve never seen the color purple in a Port-Potty either……then again, I don’t go sticking my nose in a damn Porta-Potty looking for squirrels either. Snakes maybe, but no squirrels). 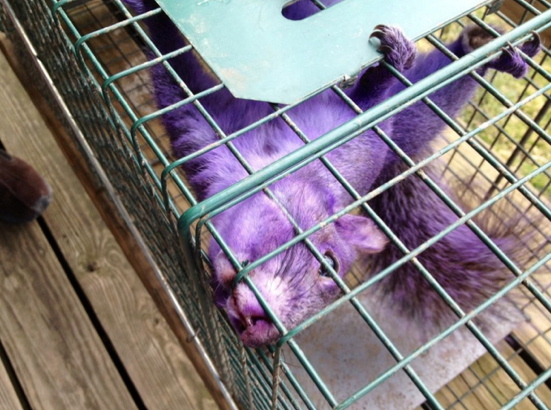 Step in a professor who says, “the purple tint could be from the squirrel drinking bromide-laced water from fracking in the area.” Squirrels frack? Is that the same as f…um…..WAIT! Ohhhhhhh, FRACKING!! Yeah, fracking is when you pump water, sand and 900 toxic chemicals into the earth in an attempt to free up trapped gas under the ground. Which is the same as taking a Beano tablet but with different results. So this professor seems to think the squirrel may have drank some fracking water. So what’s the bottom line here? And I’m not fracking around. The bottom line here is that the squirrel is purple, the couple denies that they dyed him, it appears the squirrel is not holding his breath and scientists, professors and those fracking guys have no damn clue as to why the squirrel is purple. So there is no bottom line other than the squirrel is now an Internet celebrity with its own Twitter and Facebook accounts and may soon form its own Super-Pac and run for the Republican nomination for President. And I’ll betcha if it does it’ll get more votes than Ron Paul. Or, at least more attention than Ron Paul. If……and I say “if,” it runs on the “fracking” ticket and Donald Trump does not bring up the birther issue…………………..
Only because the squirrel is…..purple. (DONATE) The MisfitWisdom PayPal donate link (blue and not purple) is posted below. If it is not highlighted, (blue and not purple) copy and paste the link into your browser and it will take you to the PayPal site where the motif is in blue and not purple….and….there are no squirrels. This entry was posted in Uncategorized and tagged donald trump, Facebook, fracking, porta-pottys, squirrels, Super pacs, Twitter. Bookmark the permalink.